The Tegtmeyer Lecture Series is in its tenth year. Please mark your calendars and plan to attend this distinguished event featuring the renowned Dr. Jeanne LaBerge. Dr. LaBerge is a Professor Emeritus of Radiology at the University of California, San Francisco. In March, 2017, she was awarded the SIR Gold Medal for lifetime achievement in the field of Interventional Radiology (IR). Until January 2018, she was a Professor in Residence at UCSF, Chief of IR at UCSF’s Mount Zion Campus, and Director of the IR Fellowship program. In 1976, Dr. LaBerge completed a masters of science in Electrical Engineering at Stanford University. She then obtained her medical degree from the University of Utah School of Medicine in 1980, completed her residency in Radiology from UCSF in 1984, and did a fellowship in Angiography/Interventional Radiology from UCSF in 1985. During her fellowship, she trained with Dr. Ernest Ring, Roy Gordon and Robert Kerlan. Dr. LaBerge served in the US Army as an Interventional Radiologist at Tripler Army Medical Center from 1985-1989 and returned to UCSF in 1989 where she has remained ever since. Dr. LaBerge is an active member of the Society Interventional Radiology (SIR), the Radiological Society of North America, the American College of Radiology and the American Roentgen Ray Society. She provides professional services to publications such as the Journal of Vascular and Interventional Radiology, the American Journal of Roentgenology, Radiology, and Cardiovascular and Interventional Radiology. 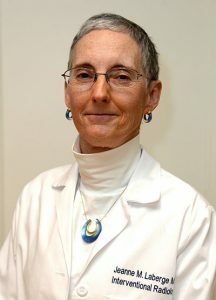 Dr. LaBerge has written and co-authored over 120 articles, served as editor of 4 books, written 9 book chapters, published 42 abstracts, and authored over 200 published articles related to her research and studies. In addition to the SIR Gold Medal, Dr. LaBerge was the 2016 recipient of the UCSF Department of Radiology and Biomedical Imaging Outstanding Alumnus Award. In 2011, Dr. LaBerge delivered the annual SIR keynote address, the Dr. Charles T. Dotter Lecture (Data Integration – The Pressing Challenge of Our Time). She has been a Fellow of SIR since 1992. Dr. LaBerge served as a Trustee of the American Board of Radiology from 2010-2018 and was a member of the Radiology Resident Review Committee (RRC) for the Accreditation Council for Graduate Medical Education (ACGME). She has played a key role in the development of the new IR Residency and IR/DR certificate.